A rekindled scholarly interest in political history, broadened by feminist historians’ newer currents, has directed fresh attention to the exercise of public power and authority by women in general and queens in particular, especially those of the Middle Ages. Though individual queens have attracted many historians’ interest today, few have investigated Matilda III of England (d. 1152), wife of King Stephen (r. 1135–54). The evidence for Matilda’s active political career considered in this chapter raises questions about twelfth-century women’s relationships to power.1 Did she wield power in virtue of her office, through her relationships to her husband or male relatives who did govern, or a combination of the two? Did she act publicly by custom, as an officeholder, or on an ad hoc basis? In the twelfth-century context, did the rise of bureaucratic kingship, and a gradual separation of the royal household from sites of governance, really effect a decline in queenly power, as has been suggested? Matilda, like her Anglo-Norman predecessors, shared in the governance of the realm—a power derived from anointment and marriage and shaped by custom and political exigency While Eleanor of Aquitaine followed some of the precedents set by Matilda III, the scope of her power was curtailed both conceptually, as reflected in the coronation ordo, and practically by her lack of English lands and the extension of royal bureaucracy. 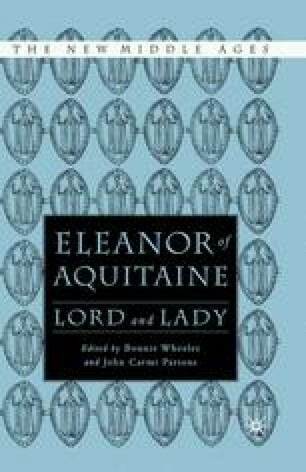 This chapter examines the career of Eleanor of Aquitaines predecessor, King Stephen’s wife Matilda of Boulogne, whose obligations and activities were shaped by custom established by previous queens and the ad hoc needs of king and realm. Eleanor of Aquitaine followed some of the precedents Matilda had set, but her lack of lands in England and the extension of royal bureaucracy circumscribed her power.